When materials are exposed to short-wavelength X-rays or to gamma rays, ionization of their component atoms may take place. Ionization consists of the ejection of one or more electrons from the atom, and may occur if the atom is exposed to radiation with an energy greater than its ionization energy. X-rays and gamma rays can be energetic enough to expel tightly held electrons from the inner orbitals of the atom. The removal of an electron in this way makes the electronic structure of the atom unstable, and electrons in higher orbitals "fall" into the lower orbital to fill the hole left behind. In falling, energy is released in the form of a photon, the energy of which is equal to the energy difference of the two orbitals involved. Thus, the material emits radiation, which has energy characteristic of the atoms present. The term fluorescence is applied to phenomena in which the absorption of radiation of a specific energy results in the re-emission of radiation of a different energy (generally lower). The fluorescent radiation can be analysed either by sorting the energies of the photons (energy-dispersive analysis) or by separating the wavelengths of the radiation (wavelength-dispersive analysis). Once sorted, the intensity of each characteristic radiation is directly related to the amount of each element in the material. This is the basis of a powerful technique in analytical chemistry. Figure 2 shows the typical form of the sharp fluorescent spectral lines obtained in the wavelength-dispersive method (see Moseley's law). 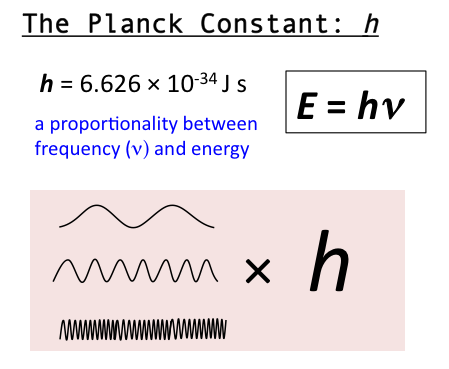 In energy dispersive analysis, the fluorescent X-rays emitted by the material sample are directed into a solid-state detector which produces a "continuous" distribution of pulses, the voltages of which are proportional to the incoming photon energies. This signal is processed by a multichannel analyser (MCA) which produces an accumulating digital spectrum that can be processed to obtain analytical data. where d is the spacing of atomic layers parallel to the crystal surface. The use of a primary X-ray beam to excite fluorescent radiation from the sample was first proposed by Glocker and Schreiber in 1928. Today, the method is used as a non-destructive analytical technique, and as a process control tool in many extractive and processing industries. 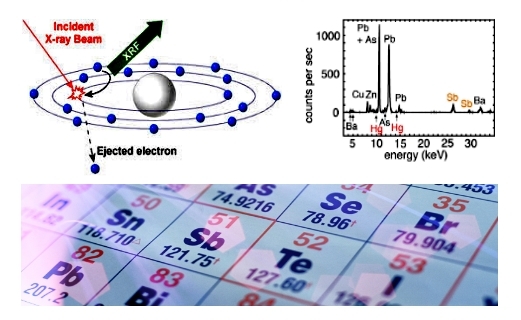 In principle, the lightest element that can be analysed is beryllium (Z = 4), but due to instrumental limitations and low X-ray yields for the light elements, it is often difficult to quantify elements lighter than sodium (Z = 11), unless background corrections and very comprehensive inter-element corrections are made. Mobile metal analyzers have been used for over 30 years to conduct metal analysis onsite. The rapid development in instrument technology has led to significant advances in the application possibilities. The current range of applications for mobile metal analyzers far exceeds the original, yet still critical, steel mill sorting requirements. Demanding metal analysis tasks such as the laboratory-like analysis of complex alloys or the detection of nitrogen in duplex steels highlight the modern capabilities of on-site metal analysis. Arc spark OES (spark OES) is the analysis method used by portable and mobile metal analyzers. The principle of the analysis method portable and mobile metal analyzers is optical emission spectroscopy (arc spark OES or spark OES). Sample material is vaporized with the testing probe by an arc spark discharge. The atoms and ions contained in the atomic vapor are excited into emission of radiation. The radiation emitted is passed to the spectrometer (arc spark OES) optics via an optical fiber, where it is dispersed into its spectral components. From the range of wavelengths emitted by each element, the most suitable line for the application is measured by means of a CCD. The radiation intensity, which is proportional to the concentration of the element in the sample, is recalculated internally from a stored set of calibration curves and can be shown directly as percent concentration. Get grade identification of metals in seconds. Including an ultra-simple pass/fail sorting mode, Ideal for the quick incoming inspection of materials. Provides reliable, highproductivity measurement and analysis. Get metal grade analysis in only 2 seconds for most alloys. Only 7 seconds for difficult light elements containing alloys, such as aluminum, magnesium, silicon, phosphorus, and sulfur. Helps provide reliable measurement and analysis of nonmetallic materials. With an outstanding level of performance. High-productivity spot checks in a few seconds. Hold on the sample longer for laboratory-quality ppm results. Ideal for environmental and RoHS compliance screening, as well as for geological exploration and more. X-ray safety gasket to prevent backscatter radiation from light": element matrix samples. S-PIN detector(on xSORTAlloy only) or high-resolution, high-sensitivity SDD. Easy-to-use wireless LAN to deliver, results anywhere on network. Users can view and manage results or collaborate remotely and archive the information. One-sample, one-time automated standardization system. Low detection limits - down to ppm range for heavy metals and now even light elements. Optional integrated video camera for precise spot testing, with visual memory storage. Interface bezel with operator-defined hotkeys to maximize speed of common tasks. "Live" analysis results (display updated every few seconds). Simplified software featuring:Touchscreen interface with only two menu levels-intuitive ease for highest productivity. Portable, energy-dispersive X-ray fluorescence (ED-XRF) spectrometers Bring lab-grade analysis into the field or onto the production floor. 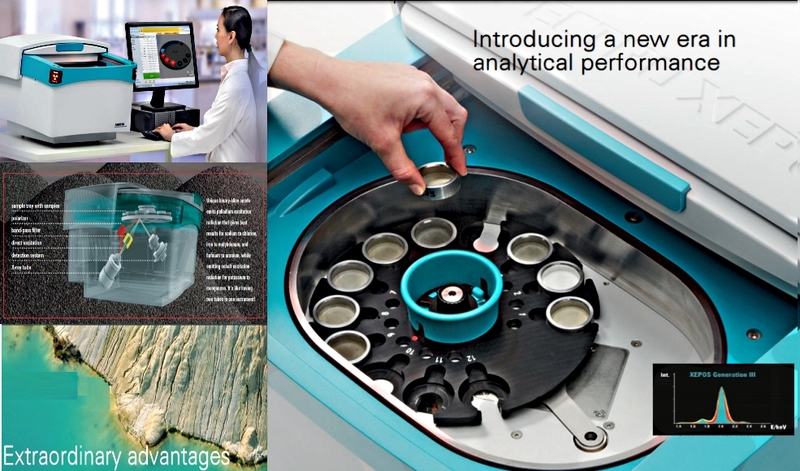 Deliver much of the analytical power of top-grade laboratory benchtop analyzers. Provide fast, dependable, truly lab-quality results in the field or on the production floor. All at a surprisingly low cost. Provide exceptional performance, at wide concentration levels. For all of the relevant elements in the range of Na - U. 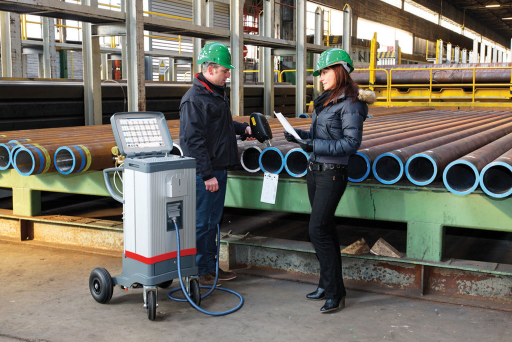 Ideal portable XRF for onsite applications where results matter. 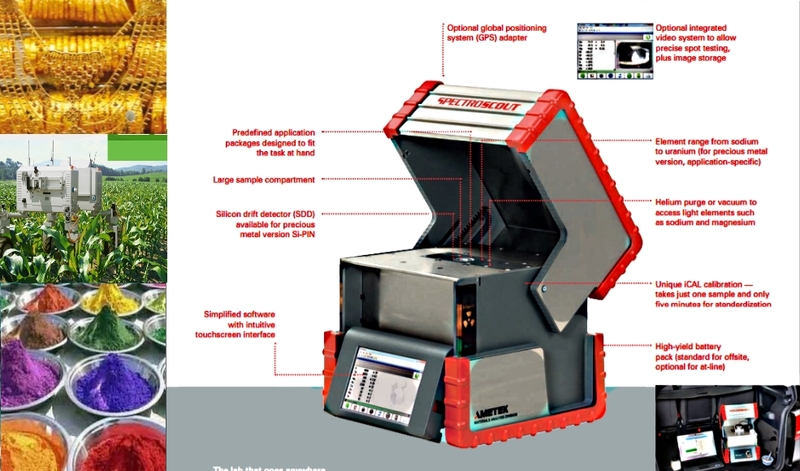 Available in two versions for field & offsite testing or laboratory & at-line testing. Simplified software is accessed via a touchscreen interface. Predefined application packages are designed to fit the task at hand. Unique iCAL calibration takes just one sample and only five minutes for standardization. Optional integrated video system allows precise spot testing, plus image storage. Optional global positioning system (GPS) adapter. Predefined application, packages designed to fit the task at hand. Large sample compartment. Silicon drift detector(SDD), available for precious metal Version Si-PIN. Element range from sodium to uranium (for precious metal version, application-specific). Helium purge or vacuum to access light elements such as sodium and magnesium. The market recognized gold standard for precious metals analysis. Widest scope of elements backed by extensive factory calibrations providing the best accuracy for traces and majors. Fastest measurement times: choose exceptional results at conventional measurement times, or conventional results at exceptional measurement times. Precious metal, compliance, element line scans and mappings testing optimizations. Smart alternative to fire assay for elemental analysis. Latest high-spectral-resolution detector technology, greatly improved count rate. Most advanced midrange comprehsive midrange laboratory XRF benchtop analyzers. Regulatory compliance, fast screening of elements as chromium,bromine, cadmium, mercury, and lead. Optional collimator changer varies the spot size to fit the required analysis area. Ultra-fast large-area mapping with Optional XYZ sample tray with maximum 4 x 4 mm spot size. Areas of concern can then be analyzed in detail with a smaller spot. From tiny fragments to larger gunshot residues mapping in forensics science. High precision, accuracy, wide concentration levels, and very shorttimes for precious alloy(often 30-40 seconds). For small jewelry items or drill cuttings from remelted samples: it analyzes a small spot (typically 1 mm). For Silver samples, which may be relatively inhomogeneous, averaged results from an optional larger spot size maintain high-accuracy results. Proprietary fundamental parameter method for alloy testing. 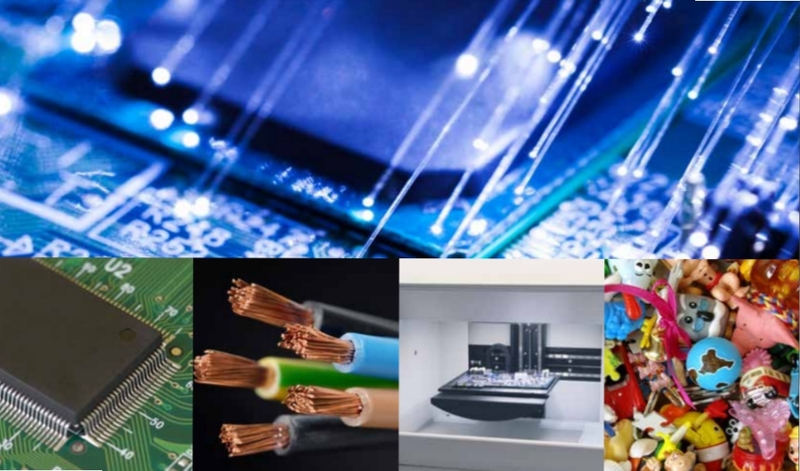 Optimized RoHS calibration covering a wide range of elements and matrices. 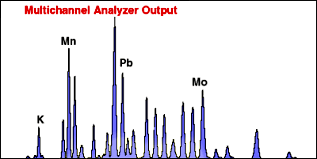 Fast point analysis can determine concentrations of typical and important elements for unknown samples. (in the range from magnesium to uranium in less than 180 seconds). Spacious chamber features a large, easy-access opening for sample placement and removal. Integrated video system aids in exact measurement positioning, especially for line scan and mapping. Optional 20 mm working distance permits focusing on irregular shapes sample points. 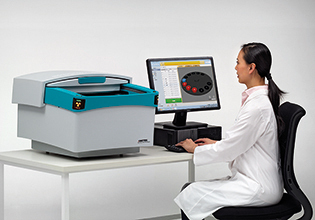 Optional motor-driven XYZ table enables line scans and mappings of large sample surfaces. The XYZ Table can also be used as sample plate for automatic test of large numbers of samples. 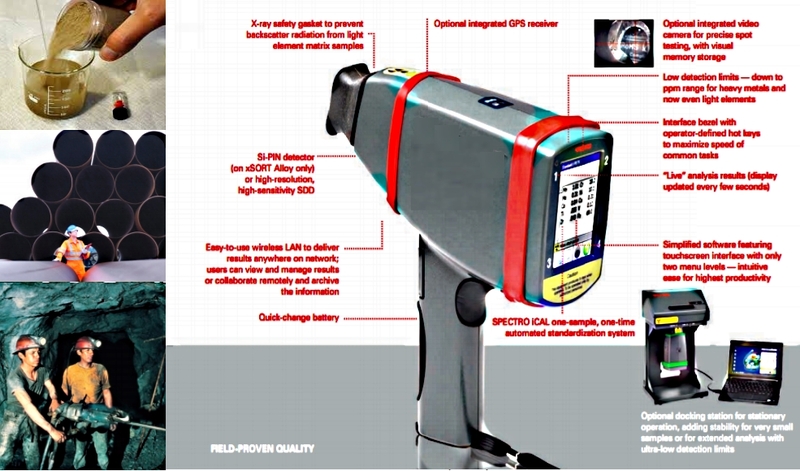 One of the fastest XRF mapping systems commercially available. Mapping of a Eurocard-format double PCB can be completed in less than 30 minutes. Relevant areas can then be rescanned with even higher spatial resolution. Intuitive software supplies all relevant information on a single screen, guiding the user through each task. Display, printout, and transfer of analysis results, support later data use and/or proof of compliance. Cost-effective with accuracy and speed than costly additional fire assay, or ICP-OES testing that requires digestion. Global Performance Services program with more than 200 service engineers in 50 countries. High-value, customized services, include proactive maintenance programs, application solutions, access to specialists, and instrument-specific training, etc. Up to 3x improvement: Precision, accuracy for trace elements and major components. Measure lower than ever: Adaptive excitation, advanced tube design, high-count throughput. Time is on your side: Exceptional sensitivity and precision or measurement times conventionally parrelled. Master the unknown: Unprecedented software tool ability to analyze most unknown samples. Software designed with users: Easiest to use and most powerful yet. Faster measurements: Meeting speed oriented applications maintaining traditional ED-XRF precision levels. Significantly lower investment cost than wavelength dispersive X-ray fluorescence (WD-XRF) spectrometers. Get WD performance at an ED price ! 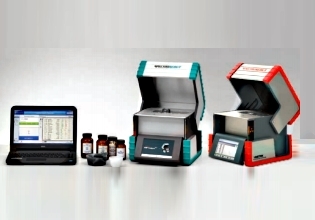 Perform on equal terms with much more expensive WD-XRF technology for many applications. Low-volume helium purging for light elements in liquids and powders. Vacuum system for solid samples. Advance predefined craft configurations for prioritize measurement requirements. One potential weakness of traditional ED-XRF designs: cycling power off between each measurement, resulting temperature variations inevitably decrease signal stability, especially with the higher count rates of WD-XRF and newer ED-XRF instruments, this can complicate analysis, add error, and degrade accuracy. Employs a new aircooled end window X-ray tube. Brighter, laboratory-quality excitation source optimized for maximum energy generation. Remains powered up, even between measurements, avoiding the instability of constant on/off cycling. New thick-target, revolutionary binary cobalt/palladium alloy anode design. Extra sensitivity and lower LODs for specific element groups. Fully realize in lower LODs, higher sensitivity, minimal matrix effect impact. Exceptional accuracy for concentrations - both high and low. Attaining substantially longer tube life. Unique revolutionary new adaptive excitation technology, enabled by new high-resolution detector and readout system. Contribute to ultra-high sensitivity and minimal background interference, for greater precision and lower LODs. Precisely configured to produce high sample throughput or best precision for target application orientations. Optimum excitation conditions for a specified group or groups of elements. The X-ray beam is optimized by fixed excitation optics with different beam channels. Combined polarized/direct excitation - For optimum analysis of light medium, and heavy elements. Band-pass filter excitation - first commercial utilization of band-pass filter for extra performance in the K to Mn range. New silicon drift detector (SDD) design. High resolution with low spectral interference. Enlarged surface (30 mm2) with maximized active area (20 mm2). High-speed readout, combined ultra-high count rate - up to 1 million counts per second (cps). Resolution contributes greatly to improved peak-to-background ratios, extremely low LODs, and ultra-high sensitivity. Even smaller peaks emerge from the background. designed and optimized with third-party testing and benchmarking. Extensive user input & feedback to be exceptionally easy to learn and use. Clearly separated modules offer optimized access to critical information. Once calibrated, routine analysis is a snap. An array of optional precalibrated application packages, meets many users' needs. Lab managers may request their own application-specific configurations. Standard analyses cover elements in the range from sodium to uranium. Superb analysis of unknown samples. Dramatically improved, more flexible, best-in-class software tool, available. Unmatched screening unknown samples for elements from sodium to uranium, without extensive setup. Handles an even greater range of samples. Including any type of liquids, plus solids from tree leaves to plastics, granite to glass - with a single calibration. Conquers matrix effects (even at low concentration levels), achieves breakthrough speed and precision, and handles previously impossible applications. Supplies screening results in a few minutes. ED-XRF requires little sample preparation relatively to ICP or AAS. Makes sample handling more convenient than ever. Spacious 372 mm (14.6 in)x253 mm (9.9 in) X 45 mm (1.8 in) measurement compartment. Accepts an optional sample tray with up to 25 positions for maximized productivity. Accommodates direct analysis of large and/or irregular-ly shaped samples. Permits analysis of light elements in powders with optional low-consumption helium purge. Optional vacuum system for economical pressed powder pellets, fused beads, or solid samples. Optional for both capabilities in a single unit. Small-spot, powerful portable and hand-held lines. Complemented by ICP-OES, such as the top-of-the-line, compact midrange, and "plug-and-analyze". Full lines of both stationary and mobile metal analyzers. Extend & Integrate the instrument's self-diagnostic functions with our WLAN monitor & service system. Including remote monitoring with ongoing diagnostics and alerts. Machine-to-machine support allows proactive alerts, backed up by direct connection with a remote service expert's PC. Ultimate in quick, sure response and resolution, ensuring uptime service . Help make certain and keep up and running for maximum productivity. More than 200 service engineers based in 50+ countries can safeguard uninterrupted performance. Maximum ROl over the instrument's entire service life. Performance maintenance, Performance upgrades, Application solutions, Consultation, Targeted training, Ongoing support.